Canada’s original find a person website, Canada411.ca is now available on through iTunes for your iPhone and iPod. 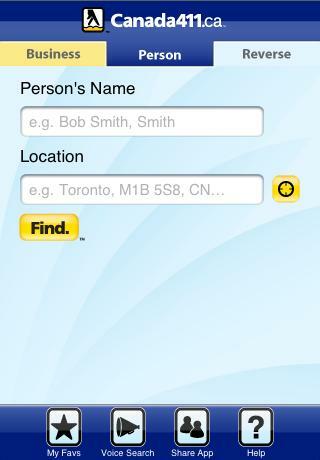 Just like your white pages, this application allow you to search for any person in Canada, coast to coast. Available for free. Click here to launch your iTunes. This entry was posted in Canada411.ca, iphone, White Pages and tagged canada 411, iphone, ipod, itunes, people finder, White Pages on April 3, 2009 by Darby Sieben.